Over summer break Fresh Ideas, the catering company contracted with William Jewell College, chose to serve The Roasterie coffee rather than Starbucks at the two campus coffee shops: @thebeak and The Perch. This partnership rekindles the relationship between Jewell and The Roasterie which stagnated when the college switched providers to Starbucks in 2013. Discussions regarding the recent change in coffee shop suppliers began between Fresh Ideas and Jewell in April 2018 and a final decision was reached in June 2018. The decision was made on the basis of student survey responses and staff feedback. Shelly King, Dean of Students, said she is excited about the switch and that it makes a lot of sense. Mary Dickerson, First-Year Experience Director, emphasized that it will have a positive effect in supporting a local business. Kiki Strecker, director of dining services, noted several advantages to a partnership with The Roasterie including a greater quality of product, increased freshness and a more collaborative relationship with suppliers. Other items on the new menu include Jewell specific coffees such as the “Cardinal Grind” and the “Wake-Up Call” – a hot-drink containing six espresso shots which ought not to be served to pregnant women or the elderly. 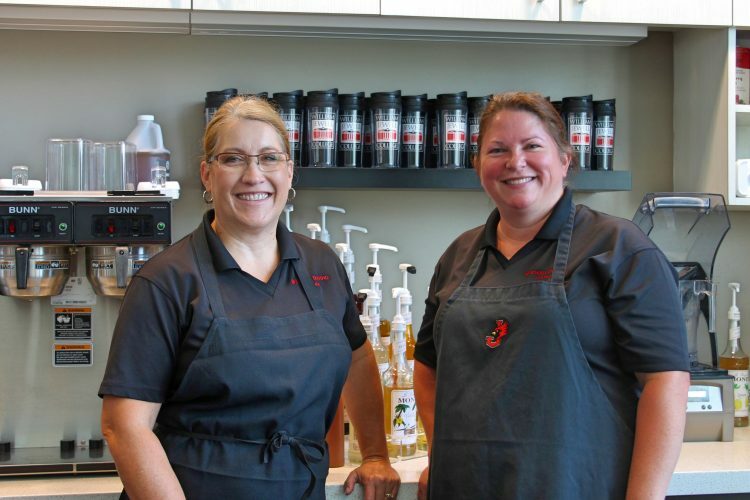 Baristas, Angela Martin (left) and Kristina Clevenger (right), prepare for work at @thebeak. The Roasterie has also worked with students to create the “Java Jewell” coffee blend which will be sold exclusively on Jewell’s campus. Sarah Lewis, vice president of the Student Senate and junior political science, business administration and ACT-In major was one of the few selected to attend a tour of The Roasterie and help create the blend this summer. Along with the new menu items, the partnership ushers in an increased push for sustainability. Kristina Clevenger, coffee shop supervisor, explained that this partnership will be more economical in production and reduce waste in sales while simultaneously allowing customers more choices. Both Clevenger and Strecker are optimistic that a partnership with The Roasterie will improve the experience of consumers on Jewell’s campus. “The small size of The Roasterie company allows them to really invest in the quality of their coffee,” said Clevenger. In fact, according to The Roasterie’s website, every coffee bean they use is handpicked and air roasted – a treatment used on only one percent of coffee beans worldwide. Strecker commented that product delivered from The Roasterie will be significantly fresher than that from Starbucks and that orders will now be processed within 24 hours as opposed to seven-to-ten days. The shorter turnaround time between order and delivery will reduce the amount of shortages in product and will enable customers to try a wider variety of syrup flavors and coffee blends, as smaller quantities can be ordered for people to sample. “The coffee is more personable,” said Clevenger. The Roasterie is a local company which was founded by Danny O’Neill in the basement of his Brookside home in 1978. Inspired by a study abroad trip to Costa Rica, O’Neill founded the company with an emphasis on using locally sourced products and directly trading with farmers, thereby eliminating third parties and ensuring that farmers receive higher profits. Jewell’s name will be added to a growing list of colleges serving The Roasterie’s signature blends, including University of Missouri – Kansas City, University of Kansas and Iowa State University. Members of the Jewell community interested in learning more about The Roasterie company and its methods can sign up online to tour the factory or to sample exclusive new coffee blends.